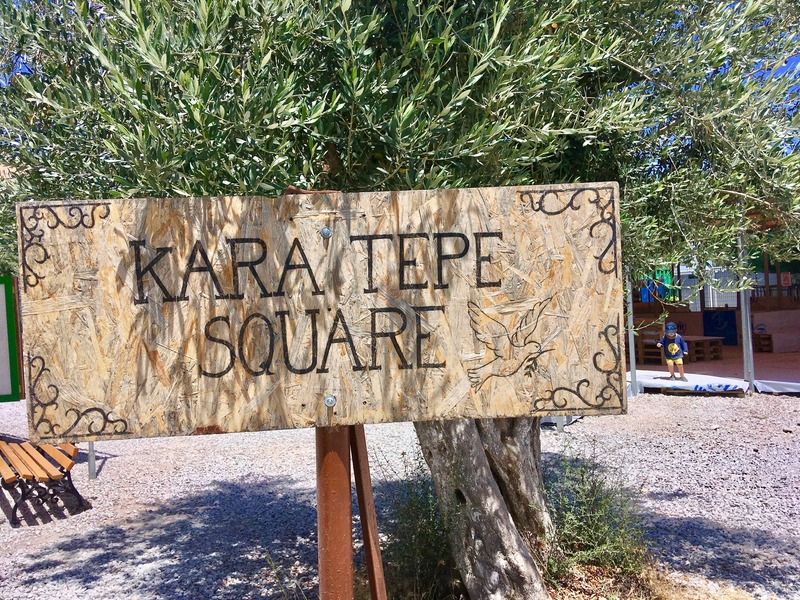 MYTILENE, Greece – Men lounged on benches in the shade and children kicked soccer balls on the gravel next to the sign that read “Kara Tepe Square.” A short walk down a path, vendors hawked falafel, french fries and beer under the midday Greek sun. A similar scene might be found in many towns across the world but this happened in the Kara Tepe refugee camp on the Greek island of Lesbos, two miles down the road from the island’s capital, Mytilene. Kara Tepe was originally a temporary stop for migrants who washed ashore from Turkey, just a few miles away over the Aegean Sea. They would wait a few days in Lesbos before taking the ferry to Athens and the European mainland. The rules governing migration changed in 2016 due to an agreement between the European Union and Turkey, so migrants are now required to remain on Lesbos. An administrator at the site said that she prefers the term “village” for Kara Tepe, and she also referred to it as a “hospitality center” during a tour given to visiting journalists on Thursday. The change in language, along with the colorful murals lining some walls, underscores the camp’s change in purpose to a long-term facility. The relative quality of the accommodations at Kara Tepe—many migrants and aid workers said that it has a better reputation than the island’s other government-run refugee camp—does not hide the fact that a refugee camp is not a replacement for a town. “It’s living in a box and still having no control over your life,” Christine Rufener, a psychologist with the nonprofit aid organization Doctors Without Borders, said about Kara Tepe at the end of her three-month mission on Lesbos. Clearly, the volunteers and professionals at Kara Tepe want to help the migrants. Tony Huijsmans, a 37-year-old Dutchman, was volunteering in the camp with his wife for the fourth time during a weeklong holiday from his job in the Netherlands. He hoped “to come here and catch the bad dreams of the children,” he said. He cooks meals, performs maintenance and leads the children in sports,. His wife offers relaxing massages to the migrants and workers in the camp. They sometimes spend 15 hours a day volunteering in the camp. Massages and games are temporary solutions for the stress and uncertainty faced by the refugees. The diversions attempt to hide the reality — that migrants who often fled war and torture are now being held by the Western governments that claim to set an example for the world. Using phrases like “village” or “hospitality center” appears to only hurt the situation, by pretending that the migrants are in a stable situation, or that the European Union has solved the crisis. Refugee camps were meant be temporary, and they must be closed in any true solution. The best outcome for the migrants would appear to remain the opportunity to make a new home in a free, peaceful country. Some observers say that will happen only if officials in Athens, Brussels and Berlin make the expensive and politically risky decision to accept migrants into their societies.